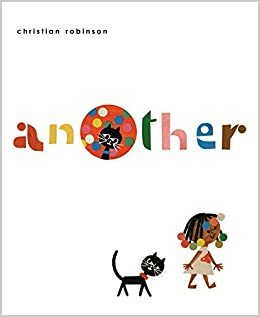 Summary: It’s bedtime for a girl and her cat as this wordless picture book opens; the cat sees a portal open in her wall, and a nearly-identical cat walks through and grabs a red toy mouse from the floor. The girl wakes up, and the two follow the new cat out through the hole. They find themselves in a new world where up is down and down is up. Other portals lead to new places where dozens of other children are playing. Finally, the girl and cat meet up with their doubles (except for a few details that are blue instead of red). The blue-collared cat tosses the red mouse to the red-collared cat, and he and the girl return to their bedroom. Everything seems to be just as it was at the beginning of the story…except that now there is a blue toy mouse on the floor. 56 pages; ages 4-8. 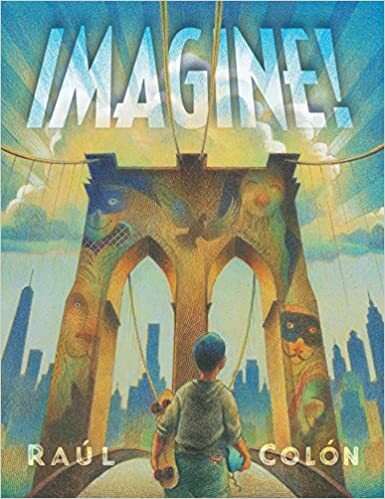 Pros: This is a real feast for the imagination…so much to look at it in the illustrations and a lot to speculate on in the crazy mixed-up world that Christian Robinson has beautifully created. Cons: I was pretty confused my first time through this book. 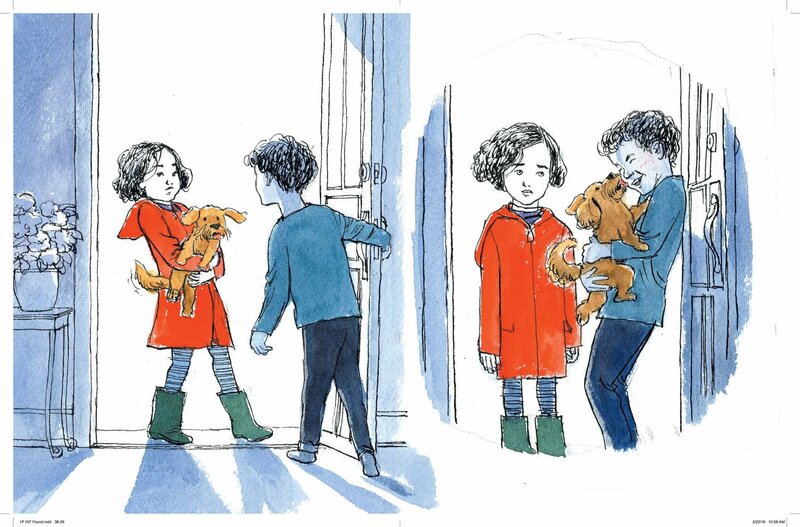 Summary: When a girl finds a new puppy in this wordless picture book, she is delighted. There are signs all around (empty dog dish, photo, and a missing poster on her bulletin board) of Prudence, a beloved dog that she has lost. 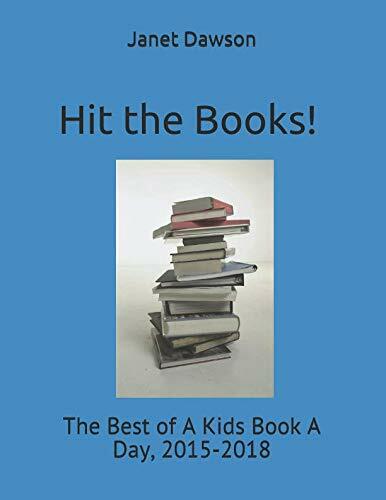 But she begins to bond with the new dog, and the illustrations show them playing, wrestling, and taking a trip to the pet store for a new leash. On the way home, though, she sees a sign for a lost dog with a picture that is unmistakably her new friend. After a night of soul-searching, she takes the dog back to his original owner, a boy who looks to be about her age. She starts home dejectedly, but her route takes her past the animal shelter. There in the window, a dog is looking out at her. The last picture shows them gazing happily at each other through the window, her hand and his paw against the glass. 48 pages; ages 4-10. Pros: The story is simple, but powerful. Kids will be able to identify the emotions from the girl’s expressions and body language, and can use clues from the illustrations to figure out what’s gone on in the past. They will learn about love, loss, and moving forward again. Cons: 2018 seems to be the year of heartbreaking dog stories. Laura Seeger, Brian Lies, and Jeff Newman: are you trying to kill me? Summary: A boy rides his skateboard over the Brooklyn Bridge to the Museum of Modern Art. Inside he is captivated by three painting: Pablo Picasso’s Three Musicians, Henri Rousseau’s The Sleeping Gypsy, and Henri Matisse’s Icarus. As he gazes at them, the figure from Icarus steps out of the painting and starts dancing with the boy. 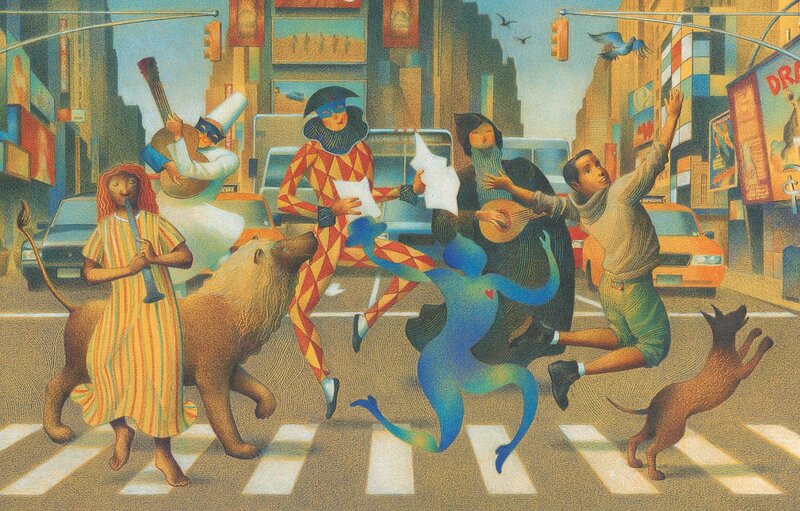 The three musicians soon join them, playing their instruments, and finally the woman and lion from Rousseau’s painting follow the group as they head out of the museum. They explore the city, riding the subway, taking a dip on the Cyclone roller coaster, eating hot dogs, and climbing the Statue of Liberty before heading back to MOMA. The boy says goodbye as they all return to their paintings, then he gets his skateboard and heads for home. Along the way, he sees a big building and is inspired to paint pictures of his new friends on its side. An author’s note tells how he developed his own love of art and hopes to inspire readers. 48 pages; ages 4-8. 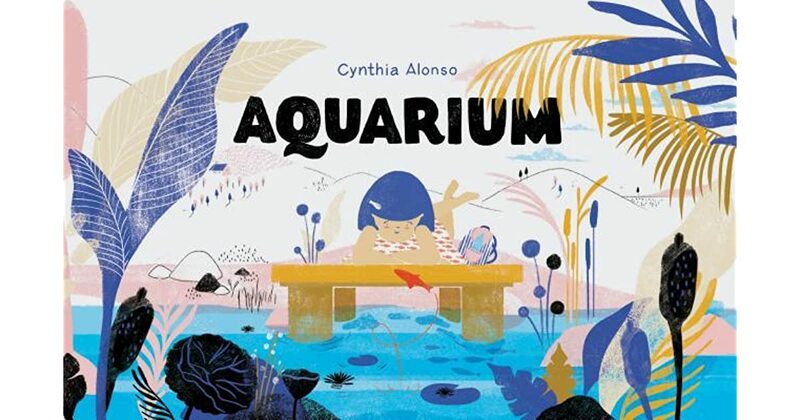 Pros: This wordless picture book is a follow-up to Colon’s 2014 Draw!, sharing with readers a love of art and creativity that started when he was a child. 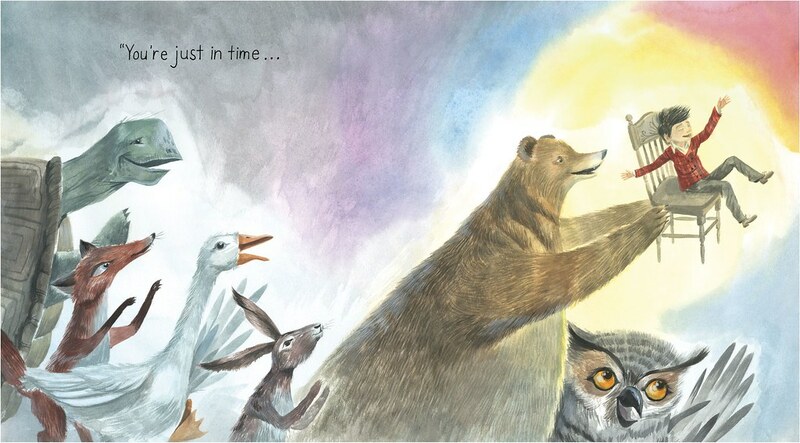 The watercolor paintings give the illustrations a dreamy quality that is appropriate for a story of imagination. Maybe a contender for Caldecott recognition. Cons: I wish the original paintings had been shown somewhere in the book. 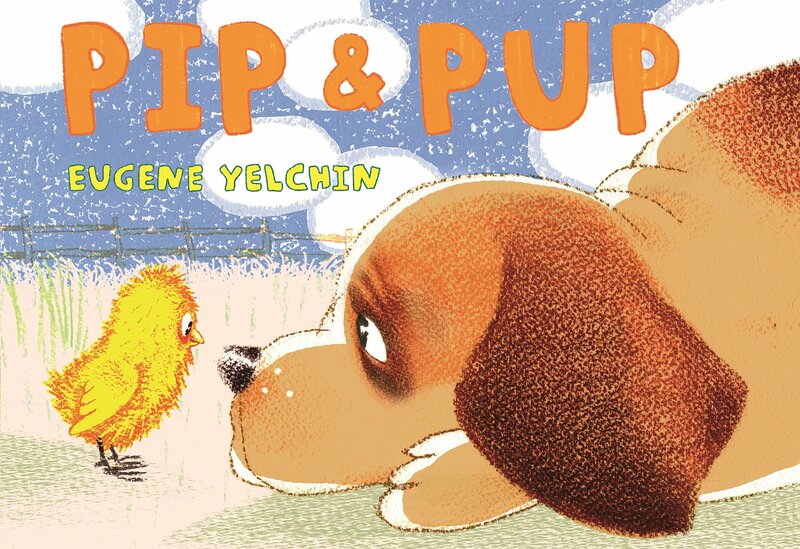 Summary: At the beginning of this wordless book, Pip, a fuzzy yellow chick, hatches out of her egg and goes exploring. The first animal she sees is sleeping puppy Pup. She pecks on his nose, then gets scared when he wakes up and chases her. She goes back to her eggshell; when it starts raining, she uses the bottom half as a boat and the top half as a hat. She paddles back to Pup, who is feeling unhappy in the rain. When Pip puts half her eggshell on Pup’s head, a riotous game begins that ends when Pup accidentally crushes the eggshell. His way to make amends? Bringing out a tennis ball which seems like it will start a whole new game. 32 pages; ages 3-7. Pros: A cute story of friendship by Newbery honoree Eugene Yelchin (Breaking Stalin’s Nose). The personalities of both animals come through loud and clear even though there are no words. Cons: It’s a pretty simple and straightforward story, without as many interesting details as some wordless books have. Summary: A boy eats and sleeps alone in some kind of all-boy institution (a boarding school? An orphanage?). One night he finds an invitation propped up against the bowl housing his pet turtle. He sneaks out and rides his bike to the shore, where a large turtle ferries him across the water to a cave. There’s a party going on, and the other animals welcome him with open arms (and wings). After a night of tea and dancing, he returns to his room. His turtle can be seen returning to his bowl just as the boy is climbing through the window. The last page shows the boy sharing the story with his new (human) friends. 40 pages; ages 4-8. 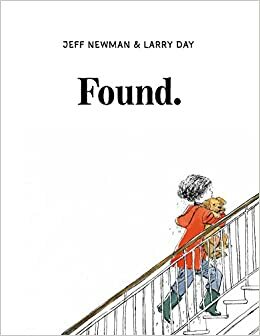 Pros: This almost wordless book (38 words) is a celebration of the power of stories to connect with others. The dedication says it all: “Dedicated to the dreamers. 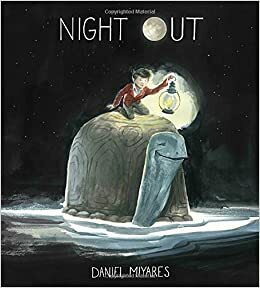 May you always feel invited.” Daniel Miyares’ evocative illustrations perfectly capture the child’s loneliness and the power of his imagination to create a happy world for himself. 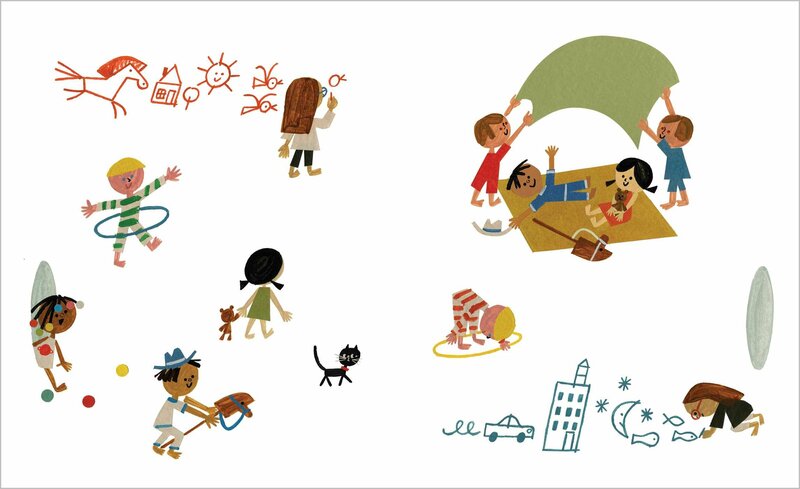 Cons: Knowing that Daniel Miyares has created beautiful wordless picture books, I felt like the words in this one were unnecessary.